In association with MotionLive and IFT Theatre, Oraltorio has been developed in part through The Collaborations at Canada’s National Arts Centre. Oraltorio originally premiered as part of The RISER Project presented by Why Not Theatre. Part poetry slam, part house party – a coming of age story like no other. 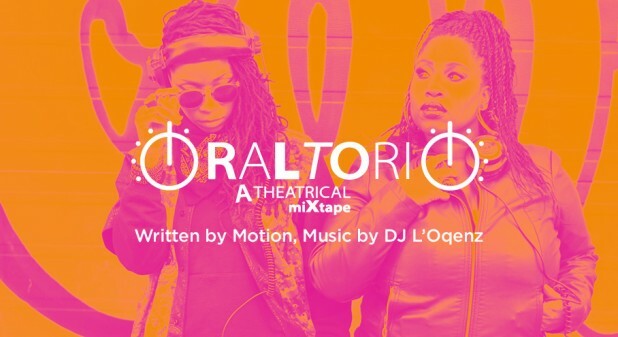 Born in the Northside, two Toronto girls grapple with womanhood and identity as they journey through their histories of ancient, contemporary, and Afro-futuristic soundscapes. The traditional storyteller and drummer are reborn in the beats and rhymes of the B Girl and the DJ. the rebellion of secret drums….